Well, we all know that besides the Emperor, Obi-Wan's got the reputation of biggest liar in Star Wars. But who's really the bigger liar, Obi-Wan or Yoda? It all goes back to 1983 and that fateful little scene in Return of the Jedi in which Luke and Obi-Wan's ghost do a little catching up. "Why didn't you tell me?" Luke's cross-examination begins. "You told me Vader betrayed and murdered my father." Luke, of course, is talking about Old Ben's original statement to him in A New Hope: "A young Jedi named Darth Vader, who was a pupil of mine until he turned to evil, helped the Empire hunt down and destroy the Jedi Knights. He betrayed and murdered your father." Obi-Wan's defense in Return of the Jedi? "Your father was seduced by the dark side of the Force. He ceased to be Anakin Skywalker and became Darth Vader. When that happened, the good man who was your father was destroyed. So what I told you was true ... from a certain point of view." "Only a Sith deals in absolutes!" "Do or do not," he tells Luke. "There is no try." Ah, those vaunted, inspirational, uncompromising words. But hold on a minute. Don't be so quick to put the little green supercentenarian on a pedestal. After all, ain't this the same Jedi Master who purposely deceived Luke upon meeting him, pretending to be dumber than Jar Jar and not the astute warrior Yoda? 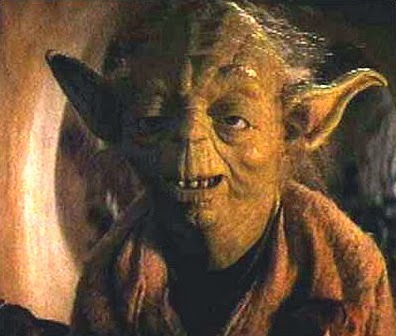 Oh, but Yoda's, like, the superest, wisest, most powerfulest Jedi of them all. He gets to do that. Cuz he knows what's right. But isn't this the same individual who told Luke that fear, anger, and aggression were part of the dark side? Indeed. Yet, isn't this the same Jedi Master who sent chills down our spines when he earlier promised Luke that the boy would know fear in his training under him? "I won't fail you," Luke says. "I'm not afraid." "Oh, you will be," Yoda replies ominously. "You will be...."
"If once you start down the dark path, forever will it dominate your destiny. Consume you it will, as it did Obi-Wan's apprentice." That would be Anakin Skywalker, right Yoda? The guy who became Darth Vader for twenty-odd years, then turned back to the good side by sacrificing his life to kill the evil Emperor and save his son from certain death. That's the example of someone forever consumed by evil you're talking about, right? "Once you start down the dark path, forever will it dominate your destiny." That's a long, long time that "forever." You might even say it's ... absolute. Now, I know--Yoda couldn't have known that Vader was going to trump the dark side. Difficult to see is the future, right little guy? That's right. Here, take this shiny, little flashlight ... there's a good Jedi Master. Now for a frightening, irrevocable thought: the chronicled advice of the Jedi Masters, the superheroes of Star Wars, is not fool-proof. We cannot take their words at face value, or at least, we cannot be so naïve as to think we can convert their words into hard and fast rules--that is, into absolutes. If we postulate the infallibility of the Jedi Masters (and there is ample reason not to), we have to at least confine their advice to the context in which they give it. Only, what good is it to follow their advice then? Well, that's just it. We're not meant to follow their advice. We're meant to understand the lesson they were trying to convey at the time they spoke--that is, the meaning of what they were, yes, trying to say. So in Empire, it's not, "Do or do not. There is no try." It's, "Do or do not. This time, there is no try, Luke, because you have to learn not to be such a wuss and give up so easily!" And "Only a Sith deals in absolutes" does not mean that Jedi don't also make absolute statements, but that, "Only a Sith deals in absolutes hastily drawn while in a state of anger, despair, and selfishness." Oh, you mean I have to interpret this stuff, now? Well, F all that. That's too hard. Well, that is why you fail, eh? So Jedi lie, Jedi deceive, and Jedi misjudge, is that it? Well, hold on a minute. It's not that simple. Let's say that Jedi Masters contradict themselves. Is that so wrong? "Contradictions or inconsistencies may be found in a book through any one of seven causes.... The fifth cause is the exigencies of method in teaching and explaining. It may happen that an involved and abstruse point has to be mentioned by way of introduction to the treatment of an easily understood subject which is quite properly discussed before that other one, because one should always proceed from the easier to the more difficult. The teacher must then rely on some superficial and crude method of explaining the point in question, without trying to expound it in full, and leave it to the imagination of his audience to understand of it what must be understood for the present. In the proper place he can then treat that more involved matter in full and bring out its true meaning." In plain English, that means that sometimes your Padawans aren't yet smart enough or experienced enough to absorb certain facts. So, you tell em the half of the truth they are ready to accept, letting it seep in so that they start deriving the logical conclusions from that fact themselves, thus helping them to prepare themselves for the second half of the truth. Indeed it is. Nobody ever said being a Jedi Master was easy. Just ask Obi-Wan. 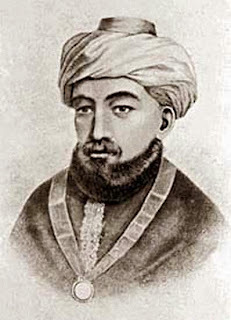 "The vulgar [that's you and me--ed., Abel] must however not be allowed under any circumstances to become aware of the contradiction of these premises, and the author [that's Maimonides--ed., Abel] will therefore at times adopt every possible means to camouflage it." You mean, he's saying our teachers should hide things from us? Oh, the humanity! Oh, the disillusionment! 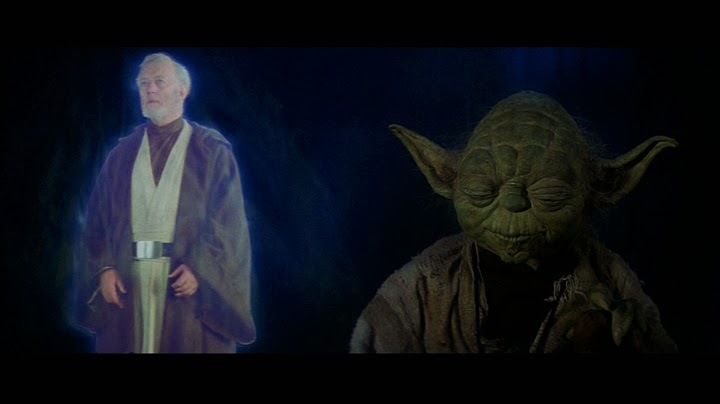 Now, remember in Return of the Jedi how Luke calls out Yoda for hiding the fact that Vader is his father? "Is Darth Vader my father?" Luke asks. "Your father he is," Yoda admits. Then, "Unexpected this is, and unfortunate." "Unfortunate that I know the truth?" Luke yells. "No," Yoda says. That part's fine, actually ... because Luke's old enough to know camouflage and half-truths are the name of wisdom's game. "So, what I told you was true, from a certain point of view..." Obi-Wan says. "Luke you will find that many of the truths we cling to depend greatly on our own point of view." Among Return of the Jedi's many towering lessons, and as the culmination of the Star Wars saga there are many, this is one we should make light of at our moral peril, unpalatable though it is. It is, at last, the confession of inevitable human agency. As Obi-Wan now unpacks his original statement about absolutes, laying it plain in all its ugly glory, a Jedi Master admits to his pupil what Maimonides does: that if the circumstances call for it, in a Jedi Master's best judgment, he will lie to you. Lie to you! It's the most fundamental form of betrayal. This is one of my favorite articles of yours. For some reason, I walk away with the words of G.K. Chesterton after reading it: "Merely having an open mind is nothing. The object of opening the mind, as of opening the mouth, is to shut it again on something solid." I haven't quite reconciled why this quote comes to mind after I read this piece - it's something I've been mulling over the past few days (and something I'll continue to chew on for a while). It'll come to me eventually. Are you going to re-publish here your article "The Tragedy of Mace Windu and the Death of the Jedi Order"? This is is by far my favorite. Although it may seem like Obi-Wan was lying at first, upon further examination, we see that Obi-Wan was telling the truth when he said that Anakin Skywalker, Luke's father, was dead. Anakin and Darth Vader, in a sense, are two different people. This can be clearly seen in canon when Vader and Sidious refer to Anakin Skywalker being dead. "Only a Sith deals in absolutes!" and "Do or do not. There is no try." May seem to be contradictory statements at first; however, when Yoda says this, he is only saying that you have to believe, you have to let the force flow through you, accept it, and only then, will you do. He isn't simply saying that there is no such thing as trying. For example, when trying to meditate and clear your mind, you don't think "clear my mind... clear my mind." You merely relax and empty your mind. You can't exactly try or force your way into doing this, you can only accept your thoughts and let them pass over you. This is the only real untrue statement and may have just been a personal belief of Yoda's, although it is typically the case that the dark side consumes and corrupts its users.